Phonophoresis is a form of treatment that involves the use of ultrasound waves to help drive a topical medicine or herbal remedy deeply through the skin and into your injured muscle or joint. This anti-inflammatory treatment can quickily reduce swelling and inflammation in a muscle, tendon, ligament or other soft tissue in the body. While inflammation is part of the natural healing process that occurs after an injury, it also causes pain, swelling, redness, tenderness, and increased temperature in the inflamed body part. 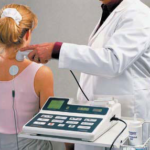 Phonophoresis has been used by physical therapists for many years to treat arthritis, tendonitis, bursitis, adhesive capsulitis (frozen shoulder), and there are reports that it is effective in treating delayed onset muscle soreness (DOMS) which can occur after vigorous exercise and usually lasts one to two days. The substances most often used during traditional phonophoresis treatments are medications that help decrease inflammation, including hydrocortisone, dexamethasone, salicylates, and lidocaine. At The Bresler Center, however, we are having even greater success using more natural remedies, including cannabadiol (CBD) and other herbal topical agents. Pain relief is immediate and CBD is now legal in all 50 states. We recommend that patients receive at least two phonophoresis treatments in our office to determine if it will help and if so, we can help patients obtain the needed ultrasound equipment and topical agents for continued use at home. To find out more, click here. If you think that a transcranial or interferential stimulator, or phonophoresis could be a helpful treatment option for your specific condition, call us for an appointment and clinical trial at 310-474-2777.